Our Batch 1000 beer on tap in Naperville has a strong citrus and pine aroma from the use of Cascade and Summit hops, while the hop flavor is impressive, it is backed up by a full body of maltiness from the increased amount of malt used. If for any reason you have any questions or comments about our beer on tap in Naperville, feel free to give us a call at 630-544-3700 or fill out the form to the right and a representative will respond shortly. The Duke is a pale ale beer on tap in Naperville that is rich in color and hints at the bold malt character used to balance the huge hoppy flavors and defining bitterness of this classic English beer. The Northern is our American lager is our mildest offering with a creamy, smooth taste. Our Prairie Vixen beer on tap in Naperville is a German style wheat beer which tastes of mild banana, clove, bubble gum and a mild spiciness to wrap up an exceptionally refreshing finish. All of our beers on tap in Naperville are brewed on site and we also have seasonal brews that are featured throughout the year. The Broad Axe beer on tap in Naperville has great hints of roasted chocolate and coffee which makes this beer a great treat. The Bennie is a German style lager that has a mouthwatering smoothness from the wonderful malt and sweet caramel flavors. 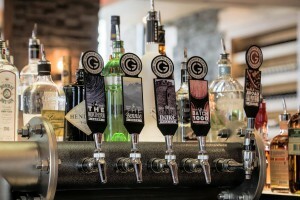 Granite City Food & Brewery’s beer on tap in Naperville is very reasonably priced compared to other breweries and don’t forget to check out our incredible food to compliment your beverage. If for any reason you have any questions or comments about our beer on tap in Naperville, feel free to fill out the form to the right and an associate will respond shortly or give us a call at 630-544-3700.